M in Wreath with "Japan" underneath-Noritake Query:- Recently my 92 year old grandmother died and I received a candy dish and bowl from her collection. I researched the marking and it seemed more closely related to the Noritake markings with the M in the wreath but I can't seem to find the exact markings which are on my set. The set is white (well maybe cream colored) and apple or lime green with a gold rim around the top and flowers painted in the bottom. The marking on the bottom has an M in somewhat of a wreath with just Japan written underneath (all in a light green). 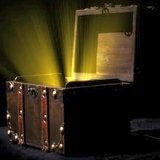 Any information about my set would be greatly appreciated. Thanks for uploading your picture of the M Japan cartouche pottery mark. A picture of the set would have been good too so as to see exactly what we are dealing with here. Oriental pottery identification and valuation is an area best left to specialists in that field, as it can be a can of worms; with fake marks abounding and even reputable makers of good renown not always putting on marks for the reason of simple identification. You could have a look at Gotheborg.com as they are the experts in all that is oriental. Reproductions of all kinds of items are found from coast to coast, and it's now "buyer beware. If it is indeed an old piece from your grandmother, that label is legit. It is Morimura which later became Noritake. 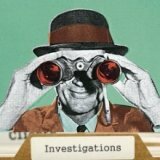 The article the other person talked about where on newer items that have flooded the market. If you look at a fake and the real thing, they are not hard to tell the difference. I have my grandmothers china. it is probably 90 years old. the mark on the botton is green. A wreath surrounding an M .Above the wreath it says NORITAKE below the wreath JAPAN. Not made in Japan just Japan. I am having trouble finding the name of the pattern. Could someone show a photo of the plate, please? I have an old set, same marking on the bottom. After more than half an hour of searching links and pictures this is the ONLY place I have seen this marking. Under a loop, there is no sign of silk screen as the colors are solid. However I believe a stencil was used because I noticed that the line up of the black and green was off. I needed the loop to see it.I also noticed the tiny strokes that transitioned the colors. I am an artist and would have needed a loop and special brush to recreate it. The workmanship is beautiful, counterfeit or not. And as I cannot find another Noritake or Morimura mark like it It doesn't matter. The piece is finely crafted, and is indeed bone china. Still, clarification from an expert would be nice. Gothenborg.com had nothing. I have a plate with that same mark so I did a lot of research and finally found it on the Noritake Collectors Guild in their backmarks knowledge library under 1930's. Received a beautiful set of porcelain from my grandmother. Purchased in approx 1931 - all pieces with this very simple marking. Would like to believe it is indeed authentic noritake. Any idea of value by place setting and serving pieces? 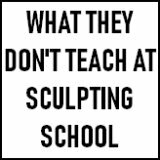 That sounds like an excellent resource. Is it online and can anyone access it? 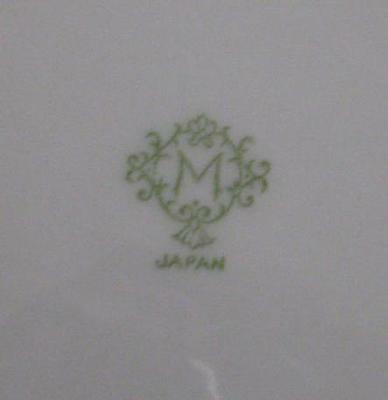 M in Wreath with Japan under M.
Does anyone recognize this pattern and advise if it is legitimate Noritake? Morimura brothers were the importers before they became Noritake. They used factories all over Japan. I believe this mark is from only one factory and i believe it is only from 1935 and prior. Patterns were not named. and many have different pieces,because they simply pulled whatever blanks they had on hand. That is why my mothers china had doubled handled soups and square salad plates while the same border and flower group can be found on coupe soup bowls and round salad plates elsewhere. These sets were sent in boxes that held the complete 92 piece set. 12 dinners, 12 salads, 12 bread and butters, 12 cups, 12 saucers, 12 soups, 12 soup plates, large platter, small platter, creamer, sugar, oval veg, covered veg., relish and ?? and they were very affordable. check out Replacements picture of Noritake patterns with an M and a number. I visited the collector's site mentioned above and found the mark listed as Noritake. So I found out there that this pale green 'M' mark was design patented notified on June 1, 1935 by Nippon Toki, who are the present day Noritake.